Pizza is something that we enjoy weekly. Seriously. So, why not share our creations with the world! Over the next year I hope to provide fresh new ideas on what a pizza is, and how they can be enjoyed in unexpected and surprising ways. Every week I will introduce our newest pizza experiment. If you are interested in following the 52 weeks of Pizza look for a new recipe every Friday! Preheat oven to 400°. Brown pancetta over medium heat in a large skillet. Once pancetta is browned, place in a paper towel to remove excess grease, break into smaller pieces, and set aside. Clean cauliflower, and break into florets. Add florets EVOO, red pepper flakes, seasoning blend to a medium size mixing bowl and stir to combine. Put EVOO coated cauliflower in a roasting pan. Roast at 400° for about 30 minutes or until golden brown, stirring once during the cooking process. 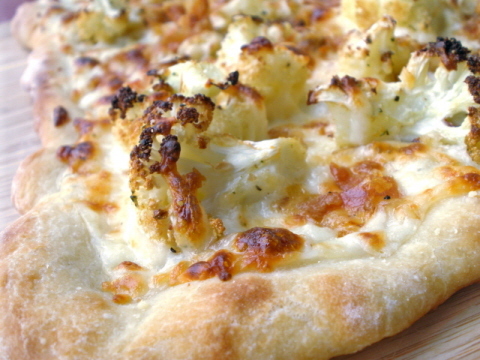 While the cauliflower is roasting shape your dough into the desired shape, adding as little flour as possible. Poke several small holes in the crust with a fork to prevent bubbling. Transfer pizza dough to whatever, pan, stone, etc you will be using for cooking. Once you have removed the cauliflower from the oven, increase heat to 500°. Brush crust with a bit of EVOO, and cook without toppings for about 5 minutes. Add alfredo sauce and spread evenly. Then add roasted cauliflower, pancetta, mozzarella, and parmesan. Cook for 10 or so minutes more, or until golden brown. How do you like your pizza? Are you a traditionalist, or an adventurer? Deep dish, or thin crust?